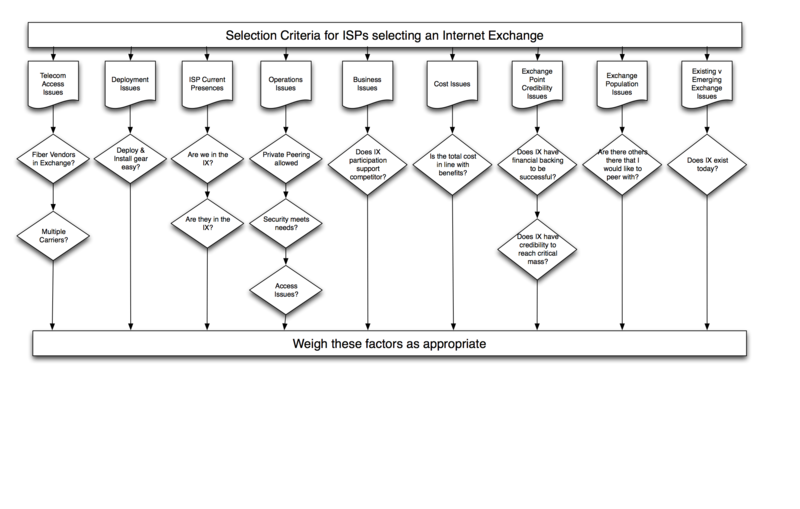 This brief documents the top selection criteria ISPs said they use to choose which Internet Exchange Point to build into. How do you choose an IX? This section details the selection criteria an ISP typically uses when selecting an Internet Exchange Point. Note that these issues are listed in no particular order. These issues are shown graphically as flowcharts and discussed in detail in the paragraphs below. These issues have to do with getting telecommunications services into the exchange. How fast can circuits be brought into the interconnection environment? How many carriers compete for business for circuits back to my local Point of Presence (POP)? For facilities-based ISPs, what is the cost of trenching into the exchange (how far away and what obstacles present themselves)? Are there nearby fiber providers that lease strands? These questions will help answer the most important question to ISPs: How fast can my peer and I get connectivity into the exchange? Multiple carriers lead to speed and cost efficiencies. Some ISPs have volume deals with certain carriers or otherwise prefer carriers and therefore prefer exchanges where these carriers can quickly provision circuits. These answers strongly impact the desirability of the exchange environment. These issues have to do with getting equipment into the exchange. How do I get my equipment into the exchange (assuming it supports collocation)? Do I ship equipment in or do I have to bring it with me as I fly in? Will someone act as remote hands and eyes to get the equipment into the racks or do I do the installation myself? Comparing exchange environments in this context, what are the costs associated with deployment (travel, staff time, etc.) into this exchange? Does the exchange have sufficient space, power, air conditioning, etc. 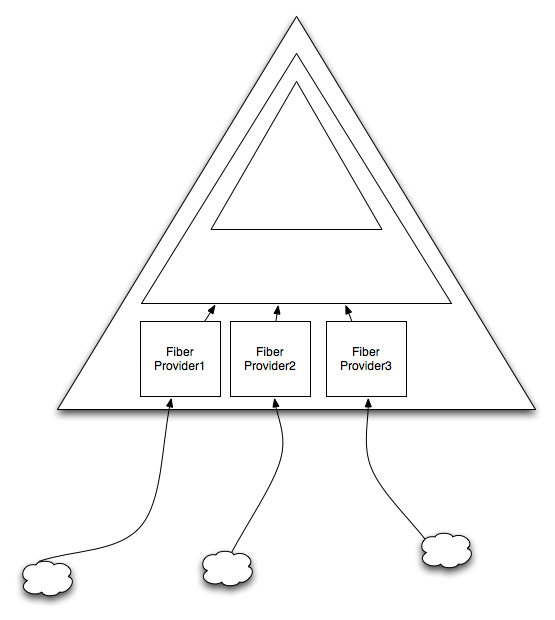 The answers to these questions impact the deployment schedule for the ISP(s) engineers and the costs of the interconnection method. This issue is based on the following observation by the peering coordinators: The most inexpensive and expedient peering arrangements are the ones made between ISPs that are already located in the same exchange. There is a hidden assumption here that there is sufficient capacity to interconnect at the exchange in either Public Peering or Private Peering arrangements. Cross-connects or switching fabrics can easily establish peering within a few hours or at most days. ISPs will prefer to interact where one or both ISP already has a presence. These issues focus on the ongoing operations activities allowed within the exchange after initial installation. Does the exchange allow private network interconnections? Are there requirements to connect to a central switch? How is access and security handled at the facility ? Is there sufficient power, HVAC, capacity at the switch, space for additional racks, real time staff support ? Is it easy to upgrade my presence over time? Upgrading in this context means the ability to increase the speed of circuits into the exchange, the ability to purchase dark fiber, the ability to increase the number of racks and cross connects in the exchange, the ease of increasing the speed of interconnection. ISPs will prefer bandwidth-rich, ISP-friendly exchanges over those with restrictions over future operations. Will using this exchange support a competitor (contribute to their net income, their credibility, their positioning)? A neutrally operated exchange (defined as one that is not owned or aligned with any carrier, fiber provider, or ISP) provides an open distortion-free marketplace for carrier and ISP services. Market distortions often result when an exchange is owned by one of its participants. This often manifests itself in requirements (required use of their carrier or ISP services) that constrain the market for services within the exchange . Since it is difficult and disruptive to move equipment out of an exchange, ISPs will prefer a neutrally operated exchange environment that will not suffer from market distortions and limitations due to business conflicts of interest. This broad issue crosses all other issues. What is the cost and value of this Internet Exchange Point? What are the rack fees, cross connect fees, port fees, installation fees? What are the future operating fees going to be? What are the motivations and parameters surrounding these fees? Cost issues shadow most of the other issues listed in this paper. Below is an estimation of the value of participation in public peering at various IXes, based on publicly available data in late 2009. It shows that the massive amount of traffic that is being exchanged in peering relationships is substantially more cost effective than if that traffic traversed their upstream transit provider. All else being equal, ISPs will seek to minimize the costs, particularly upfront costs, associated with the interconnection for peering. The credibility issue is twofold. First, credibility goes to the financial support of the exchange. Does the exchange exist today and will it exist tomorrow? During the early stages of the exchange, ISPs are asked to make a leap of faith when committing, and therefore prefer an exchange with strong backing and the credibility to survive. Observation: The Internet Exchange Points exhibit the characteristics of what economists call the “Network Externality Effect”; the value of the product or service is proportional to the number of users of the product or service . Internet Exchanges are a special case of this effect; the value of an Exchange Point is not the number of participants but a slightly more complex calculation including the number and uniqueness of the routes and volume of traffic peered. Since the value of the IX to an ISP is proportional to the amount of traffic the ISP can exchange in peering relationships at the IX, the value of the IX to the peering population follows the network externality graph as shown below. 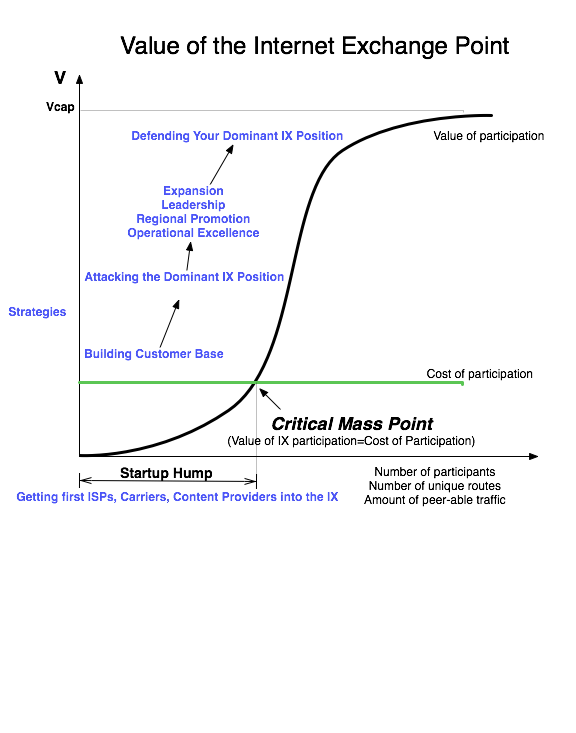 All Internet Exchange Points go through the following growth curve. They start out with zero or a few founding ISP members, and face the challenge of attracting additional peers into a building where there are not many peers to peer with. This is the "startup hump", and solutions to this problem were shared with the author in "The Art of Peering: The IX Playbook". Once the IX reaches critical mass, where the value of participation exceeds the cost of participation, the a well positioned IX experiences exponential growth. Second, does the exchange operator have the backing and credibility to attract the more valuable peering candidates? Since the value of the exchange (shown in the graph below) is proportional to the number and type of participants. Does this exchange have the backing to attract my peers? Who is managing the exchange and what technology is in use? These answer signal the credibility and survivability of the exchange. ISPs will prefer an exchange with credibility – one that is financially and technically well backed and likely to attract the most desirably peering candidates. These issues focus on the side benefits to using this exchange. Are there other ISPs at this exchange that are peering candidates? Are there transit sales possible at the exchange? In the context of the credibility issue discussed above, who will likely be at the exchange in the future, and when will the cost of participation equal the value of the interconnection (also known as the Critical Mass Point)? ISPs will prefer an established and well-populated exchange, particularly one with potential customers that can generate revenue. 9) Existing Exchange vs. New Exchange? There are many operational exchange points in each region of the U.S. There are also emerging (soon to exist) exchanges that may be considered as peering points. However, given the pace of ISP expansion, it is unlikely that emerging exchange offerings are differentiated or compelling enough to be preferred over existing exchanges. Chronic traffic congestion can influence the decision to plan to peer in an existing malfunctioning exchange or wait until a better exchange opens. Customers with heavy flows of regional traffic can also influence the decision. Long term benefits (scalability) may lead to preferring a next generation exchange. However, all else considered equal, ISPs generally prefer an existing exchange to an emerging one. The ISPs we spoke with shared with us varied weightings of the importance of each of these issues. To some, the most important issues were the business issues, and others weighted more heavily the operations issues. Each ISP places higher or lower importance on different issues and not surprisingly select their operations environment based on their specific criteria.